I’ve been back for a week now from a trip down south. I decided to travel down to the new forest and a few other locations nearby to see what the photographic opportunities were like. I had no set plans or places to be at any given time. I like to be a bit of a free spirit and travel this way. Shortly before my trip my laptop died on me, no laptop presents a bit of a problem as far as digital photography is concerned. I was able to borrow another laptop (which I am still currently using) however this only allows me to transfer my files from the memory card to my external hard-drive as there is no photo editing software installed. Also the screen on this borrowed laptop has not been calibrated for photo editing unlike my own laptop. I’ll soldier on until I decide what to do, from the feedback I’m getting at the moment it is looking like my laptop cannot be repaired. Computer problems aside I was still able to click away with my camera. I have decided to do a short blog about my trip. All the images here are unedited images warts and all. Straight from camera converted to jpeg, re-sized for blog. The first stop on my journey was a slight detour to stonehenge. This is a place I had never been to before so did not know what to expect. I had heard comments from people who had seen stonehenge regarding the size or rather the lack of size – “is that it? it’s not very big!” so I was under no illusion of what to expect. 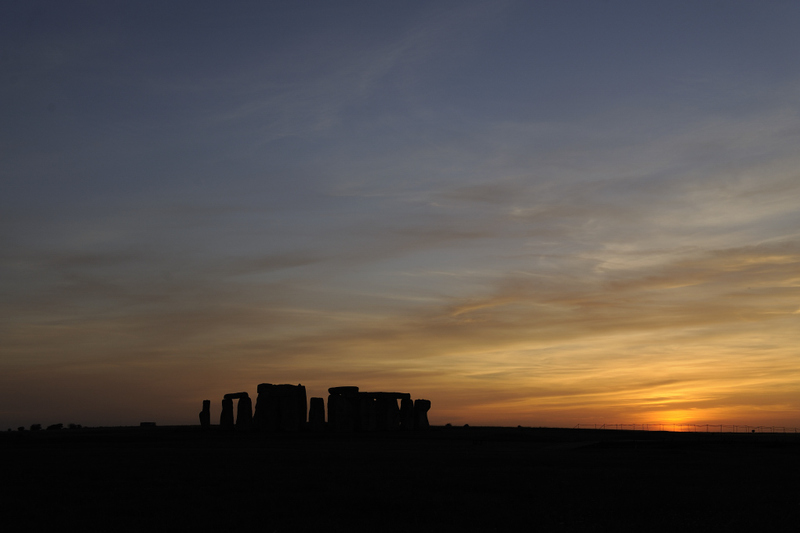 I photographed stonehenge at sunset and again at sunrise the following morning. 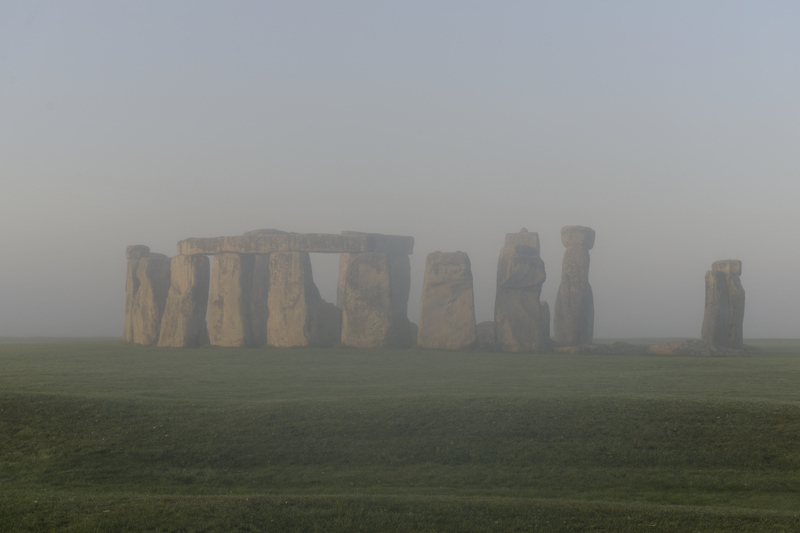 Stonehenge is situated next to the busy A303 main road and A360 junction. A perimeter fence approx 8′ high runs alongside the road. Access to the monument was between the hours of 09.30 and 18.00. At the time of year I was there the sun was rising at approx 06.30 and setting at approx 19.40. I think these are the best times to shoot, this meant that my only option was to shoot from outside and over the fence. The mist during the morning was quite thick, sometimes thick enough to obscure the stones from certain positions. Now that I’ve got some images from this location I can cross it off my list, however I don’t think I’ll be in any rush to return. For anyone living nearby it would probably be worthwhile shooting over there during misty mornings or during sunsets to check out the possibilities. Early morning mist shrouds the valley before sunrise. The New Forest 2012. After Stonehenge I decided to head towards the New Forest. I had only been through the New Forest once before and that was 10 years ago while on my way to board the ferry from Poole to France. On my road atlas the New Forest covers quite a large area so I had no idea where the best places were to visit. I stopped in many of the parking areas and explored the pathways through the woods. Many of the large open scrub areas were covered in heather which was in full bloom covering the ground in a carpet of purple. I photographed some of the New Forest ponies which roam free throughout the forest. Some of the other wildlife was a bit more elusive, although I had a good view of a fox sitting by the road as I passed by and some deer walking along the verge. (no photos as I was driving and in traffic – always the way!) I photographed some sunrises with the mist in the valleys and I tried some multi frame panoramas. 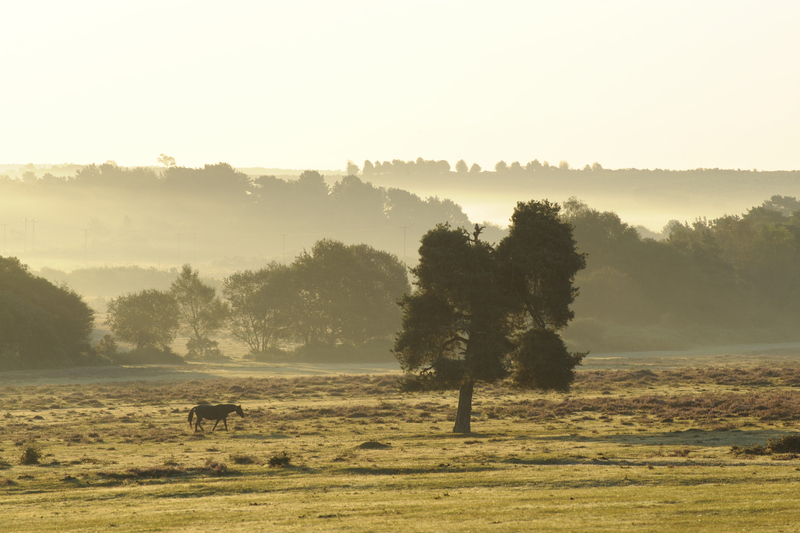 Sunlit horse in the new forest photographed early one evening. Exposure set to -3 stop underexposed. I was surprised how busy the New Forest was considering it covers such a large area. During the weekend some areas were too busy for me, the number of pet dogs outweighed the ponies. I always wait till the schools have gone back and things have quietened down before I travel, god knows how busy the New Forest is during the school summer holidays. 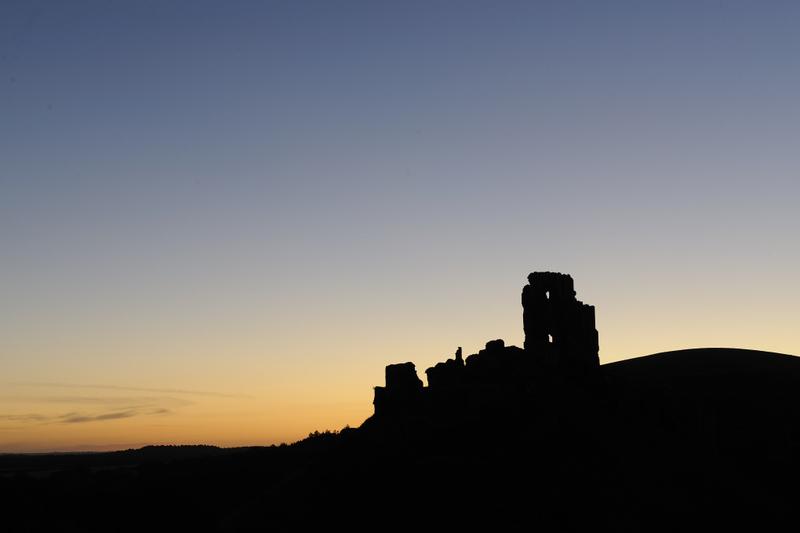 The next location I visited was Corfe Castle. I’ve seen many great images taken at this location however my time spent here was not so successful. It was at this point that the weather (which had been perfect sunshine) changed to what we come to expect living in this country – overcast and gray. I stayed, hoping the clouds would break before sunset. I used the time to climb both hills overlooking the castle to try to find the best viewpoints. The clouds did not break and the following morning things were worse as rain had started to fall. No sunset shots and no sunrise shots only a bleak gray scene in front of me. I pondered the situation and decided to visit other locations in the area, at this point I knew the rain was here for the day. I stopped at a few well-known photographic locations along the coast just to see where to park, how far the walk is etc. in preparation for future visits. 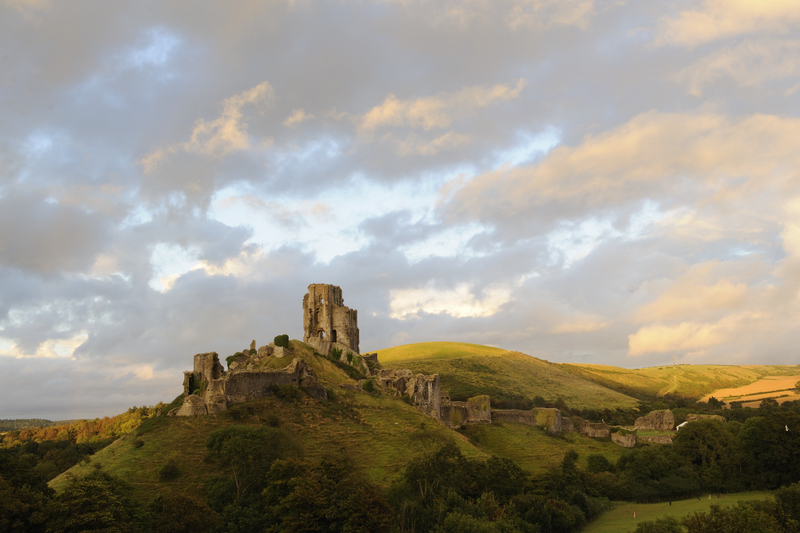 I spent the next couple of days staying with a friend before returning to Corfe Castle to try again. The weather was more promising however the sunrise did not provide the results I had hoped for. Oh well such is photography! Great photos! It was so nice to see Stonehenge in a different light. Thanks for the comments. This was a firstime visit so was not sure what photo opportunities were like. Sunrise and sunset look like the best times and there’s not many angles because of the fence.